Avoid Scams! Digital Altitude and MOBE Alternatives for 2019 (and beyond). 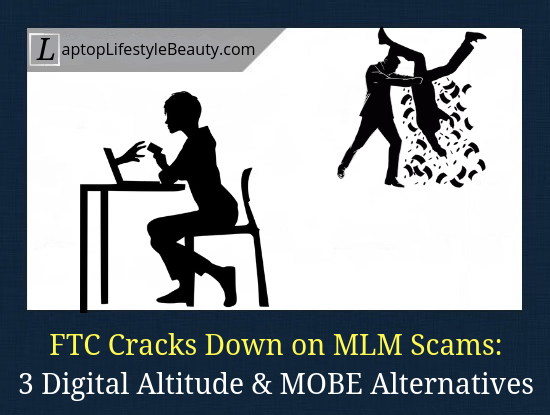 I wanted to dedicate some time to talk about Digital Altitude (DA) and My Online Business Education (MOBE) which were finally announced as scams by the FTC in 2018. Specifically, I’ll provide 3 trustworthy alternatives to Digital Altitude and MOBE. The platforms are not MLM networks. Moreover, over the years they have proven themselves as legitimate money making opportunities. Before we move forward, I’d like to say a few words about Digital Altitude and MOBE scams (officially announced by the FTC). I will also talk about the never ending battle between affiliate marketing vs. network marketing people. Back in February 2018, when Digital Altitude has been cracked down by the FTC, I wrote an article where I talked about my personal experience with this platform. Is Digital Altitude a Scam? FTC Says Yes. I had conflicting feelings about DA, probably due to Shiny Object Syndrome, yet I saw the red flags that DA might actually be a scam. Luckily, due to some circumstances in my I never ended up paying more than the initial $1 fee. It’s been said that DA used digital marketing products as a disguise to lure innocent people into the system and recruit more people. Basically, members are required to pay for a series of tiered memberships with increasing fees. Back then I learned that Digital Altitude copied pretty much everything from MOBE so I thought that if DA had been cracked down by the FTC because they rip people off, then it’d be a matter of time before MOBE gets served as well. After I published that article about Digital Altitude, I received a few comments about MOBE, where some people said it was a scam and others aggressively attacked that these companies are not scam. Minhaj shared that unfortunately he fell for the company that the DA copied, which was MOBE. (I wasn’t very familiar with it until he mentioned it). Lucky for us, there was an undercover investigator indeed! A typical ad hominem attack (attacking me as a blogger and not the substance of my argument at hand). As I told Mike back then, I may be just a regular blogger but I don’t recommend network/MLM programs. Instead I recommend programs that are affordable to the public and actually are legit money-making opportunities. There are two camps – affiliate marketers and network marketers -and generally people tend to stick to their “camp”. I don’t plan to “convert” anyone into my “religion” but if you’re only starting to explore online opportunities, I’d recommend choosing affiliate marketing over multi-level marketing. I don’t like recommending programs that have even a slight scent of it being a “scheme”. I am sure you, as my reader, wouldn’t want me to recommend it too, right? There’re enough scams already on the Internet! Now, what about affiliate marketing? To me, affiliate marketing is simply helping Internet users what they are looking for, without feeling like a sleazy salesperson. And having a website/blog is what connects me with my audience. Lately, I am heavily involved with Amazon niche websites, and being an Amazon Associate definitely pays off. Anyway, why do I prefer affiliate marketing over network marketing? Now, what is a Digital Altitude or MOBE alternative that I wanted to talk about in this post? Well, my main recommendation is Wealthy Affiliate. It’s a major affiliate marketing platform/training centre that’s been around for over 13+ years. how to make money with your online business. People tend to over complicate this process, but really it comes down to these 4 steps. Why do I recommend this program as an alternative to Digital Altitude or MOBE? I’ve been a member since 2015 and know the platform inside out to say that it’s legit. It offers a free membership, without any credit card info (à la try it before you buy it). There an entire community of like-minded individuals to support you (including me!). Basically, at Wealthy Affiliate you’ll have all the training, tools, and support necessary to succeed online. Wealthy Affiliate is my #1 recommendation without any doubts. Just like Wealthy Affiliate, Affilorama is a legit opportunity and works for beginners and advanced marketers alike. Without doubt, you can start there to learn about affiliate marketing (free resources are helpful too). If you decide to join as a premium member you’ll have to pay slightly more than if you were to upgrade to Premium membership at Wealthy Affiliate (offering a 61% discount for the first month). Of course, I always recommend test-driving an entire platform for FREE before upgrading, just to see if it really is for you. Let’s move to my third DA and MOBE alternative. I am not even affiliated with this program. Join Fizzle’s 2-Week Trial for Free. Fizzle is more about online business start ups, whereas WA is more about affiliate marketing. Both are great membership programs that offer a LOT of value for their members. This one is more of a bonus alternative that you can join today and it’s 10000% free. Swagbucks is a fun rewards program that gives you free gift cards and cash for the everyday things you already do online. I love it because it doesn’t require much energy or time on my part. It’s not something that will make you a millionaire but it’s definitely a legit way to make pocket money for yourself. What are your thoughts about these alternatives to Digital Altitude or MOBE? Are you a beginner or an experienced marketer? Are you into affiliate or network marketing? If you have any questions, comments or suggestions, let us know in the comments!